State Congress infighting has again came in fore as on the appointment of chairpersons’ of various boards and corporations, rival camp has lodged a complaint with party president Sonia Gandhi that Chief Minister Virbhadra Singh was functioning in an arbitrary manner and rewarding only his loyalists with the plum posts. 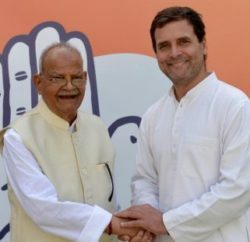 Over the issue of appointment of chairpersons,’ Cabinet minister Kaul Singh Thakur and All-India Congress Committee secretary Asha Kumari met Sonia Gandhi and complaint against Chief Minister. Disgruntle leaders pointed out that the appointment had not been made on merit. Candidates who had lost were being rewarded with sinecure jobs on factional considerations while those who had won were left high and dry. They urged Sonia to cancel the appointments and stop Virbhadra Singh from making any further appointment. Though there is no clear message from party high-command, but rival camp is claiming that the appointments would be reviewed and no fresh appointment would be made without the approval of the high command. Virbhadra Singh is likely to meet Sonia tomorrow and she will have the final word on the appointments. The issue of the appointment of the HPCC chief is likely to be discussed as well.